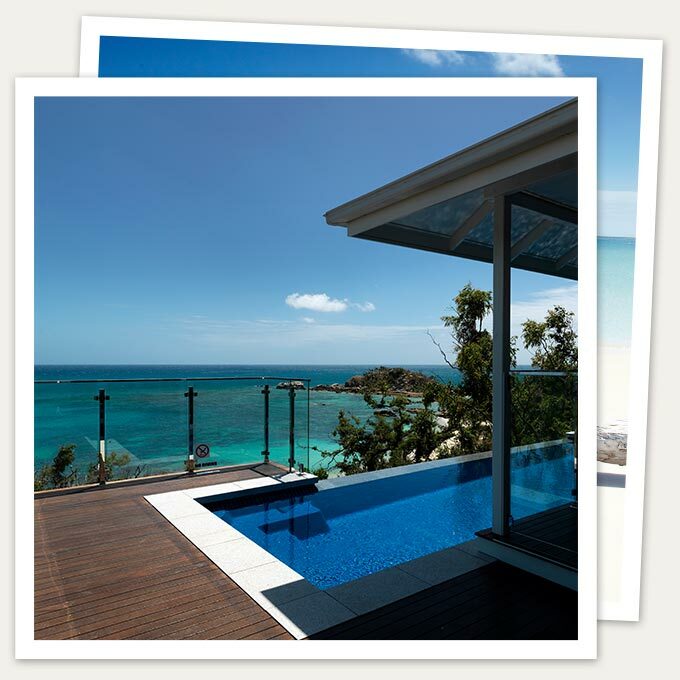 Lizard Island offers elegant, yet understated Great Barrier Reef accommodation. The Villa’s cliff top location provides you with the ultimate privacy and stunning ocean vistas whilst the interior delivers on space and understated elegance. Interiors by Hecker Guthrie focus on natural tones and finishes that together with the natural and ambient light create a residential style and experience that is the epitome of understated elegance with a subtle infusion of indulgence. Featuring two bedrooms, both with en-suites, the master with a luxury bath, The Villa can accommodate up to 5 guests. The open plan lounge and dining area is complete with a kitchenette, with double doors leading to an expansive deck, overlooking a private plunge pool. 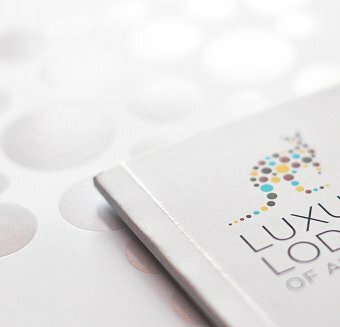 Guests will be able to enjoy daily sunset champagne and canapés served in their room. Private dining is available in The Villa, with your own personal chef and wait staff as required for an additional cost. Please advise resort reception with a minimum of 48 hours’ notice. Positioned high above the Coral Sea and set on the point of Sunset Bay. The Pavilion combines complete privacy with a spectacular 270-degree panorama of Anchor Bay, Osprey Island and Sunset Beach. The Hecker Guthrie designed interiors offer a neutral palette with touches of colour that take their inspiration from the reef – coral, blue and green. The lounge area has glass sliding doors opening onto a majestic wrap around deck creating a sense of understated elegance and offers the perfect inside-out ambience. The plunge pool and private gazebo are perfectly positioned to make the most of the sea breeze with gorgeous views extending the private landscape of this stunning suite. Private dining is available in The Pavilion, with your own personal chef and wait staff as required for an additional cost. Please advise resort reception with a minimum of 48 hours’ notice. Set in a broad sweeping arc along Anchor Bay, with easy access to the main Lodge, Beachfront Suites offer captivating sea views and each has a pathway leading directly to the beach. The natural interior tones and fabrics seamlessly blend the indoors and out in an elegant and spacious open plan design. A large day bed on the expansive deck is the perfect location to relax and take in the natural beauty of Lizard Island. These spacious suites accommodate up to 3 people and are loved by those wanting close proximity and access to the beach. Are set high on Sunset Bay offering filtered sea views over Sunset Beach and easy access to a string of secluded beaches. 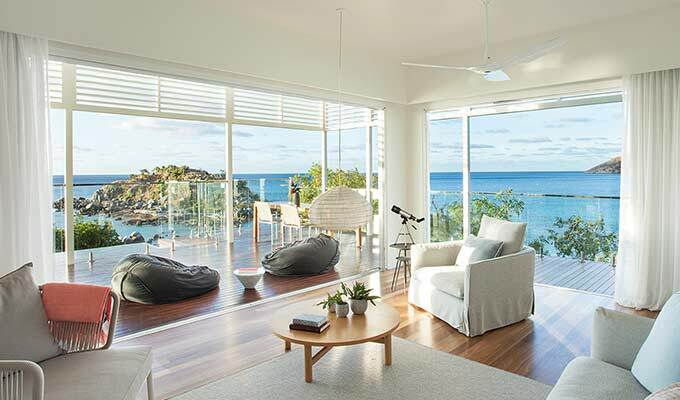 The Hecker Guthrie interiors and bathrooms make these rooms ideal for the relaxed island life. Only steps from the beach, each Villa has a private plunge pool and a deck with table, chairs and a beanbag. B&O Bluetooth speakers, LCD Smart Television, these villas accommodate up to two people. Oceanview Villas are set high on Sunset Bay offering filtered sea views over Anchor Bay or Sunset Beach and easy access to a string of secluded beaches. Only steps from the beach, each Villa has a private deck with table and chairs, the perfect place to relax and enjoy the view of lush island greenery and calm sea waters. A padded box seat sits in a bay alcove, providing another place of comfort to take in the breathtaking views. Gardenview Suites offer our guests a sense of secluded privacy and total immersion into the lush tropic and beach surroundings. With a separate bedroom and living room, these suites are spacious and can accommodate up to 4 people. Easy access directly onto the beach and interiors by the Hecker Guthrie team – make these small suites comfortable, intimate and welcoming. Gardenview Rooms are perfectly located for ease of access to the natural beauty of Anchor Bay. These rooms are designed to ensure a relaxing stay and feature the understated interior design elegance that Lizard Island is renowned for. Smaller than our suites, these rooms also feature B&O Bluetooth speakers and a LCD Smart Television. Lizard Island annual closure for 2018 is from 29 January to 11 February 2018. The airy Beachfront suites face directly onto Anchor Bay and the beachfront. The complete romantic retreat with beathtaking views over the point.